When I was a runner, I didn't do the whole distance thing. I put on my shoes, I got my rear end out the door, and I ran hard for 30 minutes. And then I met John. He's a distance runner by nature so my fast spurts didn't really appeal to him. Nonetheless, the boy was smitten with me so he laced up his shoes and hit the pavement with me often. If my motto was get going and get it done, his was most certainly slow and steady wins the race; and he is as slow and steady as they come. During one of our runs, where I told him he was dragging his heals and prolonging what I wanted to be done with, he kind of smiled at me and started talking about his days of playing tennis in high school. Apparently they called him the bulldog because he play slow and steady, and he could wear out his opponent even if the rival was a "stronger" player. So I married John knowing that he was Mr. Slow and Steady, except when it came to marrying me; then and only then was he fast-paced and quick acting. Buying anything, picking doctors, mapping out trips, planning for the future, buying a house -- all slow and steady. It used to drive me a little nuts, but lately I've been learning why the old adage -- slow and steady wins the race -- is likely true, especially if that race is a long and daunting one. Especially if that race is the race of life. I've always been fast paced, a doer who gets it done; it worked well for a long time until it didn't. After I gave birth to our second boy, I realized I was running on fumes. I needed more down time. I needed less busy. I needed more rest. I was sick. I was always tired. I was never rested enough. Slowly I began to give myself fully into rest times, vacations and relaxation, steadily letting go of the busyness and fast pace that was killing me. Going at a million miles per moment had left me tired, sick and malnourished in so many ways I didn't even fully understand until I started to become healthy, maybe for the first time in my life, physically, emotionally, spiritually and mentally. It's been a long road of rebuilding, and I'm still on it. There is no "get it done" to this; it's slow and steady all of the way. The road to real health often is. This morning, I'm snuggled up against my youngest boy, and I'm a little bummed. We're missing day two of Christmas choir shows as well as our normal church service because he fell to the flu this past week; I've been dancing the line of sick and well for the last 24 hours. I internally groaned when I started feeling like I was also getting sick because now is not the time for illness, I'd said. It's Advent season, and I want to engage fully in everything fun. We're also only a week out from our host daughter arriving from Eastern Europe, and I have much to prepare. I'd planned on going full-steam ahead from now until she arrived. But yesterday I had to make a choice. I could run forward and run myself into the ground and full-fledged illness, or I could slow down, take it easy and go at this slow and steady, resting more than moving and listening to what my body needed. This morning, I'm asking my brain to slow down, too. I'm inviting it into rest and relaxation so that I can burn brightly instead of burning out. This slowness isn't just affording my body a chance to heal; it's also giving my mind and heart a chance to focus on making space for Jesus as we prepare to celebrate the greatest gift the world has ever received. Slow and steady may not be my natural inclination by any means, but it builds endurance and that in itself gives the strength and perseverance needed to run the distance. 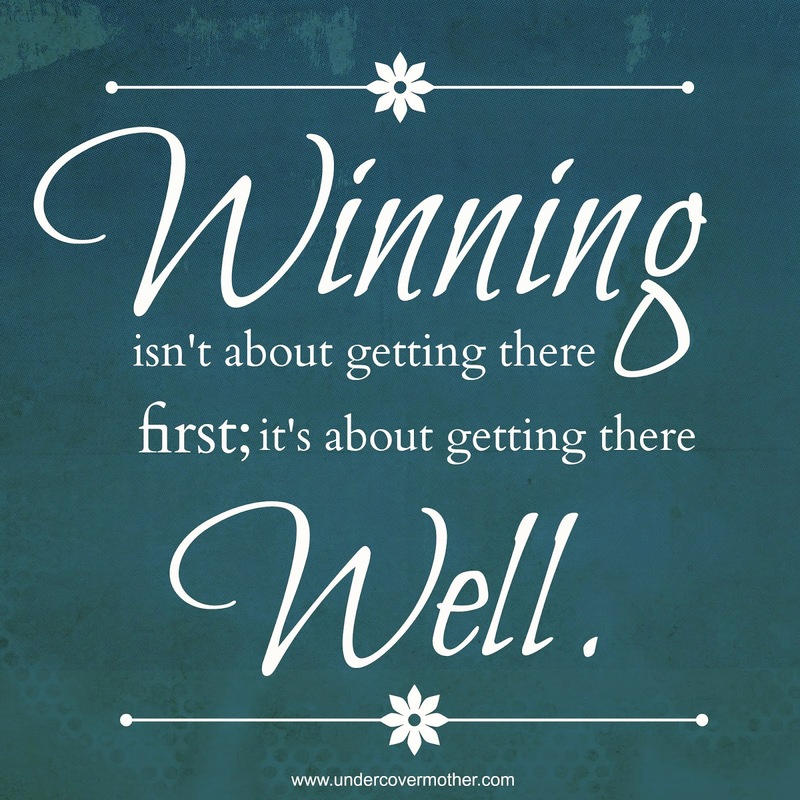 And I've come to the conclusion that winning isn't about getting there first; it's about getting there well.